Whether you are a simple welding toiler or a person who relies on the performance of your welder on a daily basis, a good MIG welder is an asset to any garage, shed, or machine shop. Purchasing a more high-performance welder essentially pays itself off via faster and more efficient joints with cleaner seams. With a quality MIG welder the thickness of metals to be joined increases without sacrificing precision and at the same time limits the amount of scrap created and rework required. Perhaps most importantly, a good MIG welder creates a joint you can trust. By Gregory Sanders: This article has been updated to reflect the most accurate information regarding MIG welders available for those who are interested in welding. The best 6 available have changed, and information has been added to assist individuals in finding the best MIG welders currently available on the market. The FAQ has also been updated. 110 volt welders are perfect for smaller jobs and can be found at a much more affordable price than their higher voltage counterparts. Just because the voltage is smaller though doesn't mean that power and weld quality should be sacrificed and these MIG units provide plenty of spark for their price tag. There's a reason that the 500559 is Hobart's most popular welder – there's simply nothing that the machine can't do. This MIG welder comes ready to run with no extra kit required. The machine is portable and versatile, operating on a standard 115V household circuit with the ability to weld automotive equipment, household components, or even farm machinery. Here's our in-depth review of this welder. The Longevity Migweld 140 is perhaps the perfect combination of price and power in a 110V welder.It's harder to find a welder that does more as the Longevity Migweld outperforms models that costs hundreds of dollars more. The machine can operate on gas or with flux-core gasless welding and with the use of the additional spool gun can also join aluminum or other exotic metals. The Migweld 140 weighs just over 50 pounds and is extremely portable. The easy-to-use model is also friendly to beginners but capable of performing more industrial welds up to 3/8” thick. 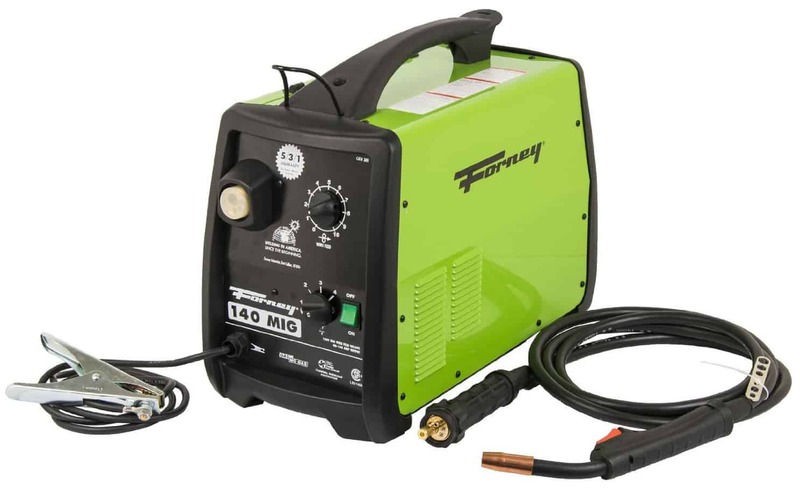 The Forney 309 is definitely one of the most stylish MIG welders on the market, available in a striking bright green unit. What most users want is performance though and the machine doesn't back down in that aspect. With both MIG and flux core capabilities the Forney is completely portable for use in automotive, farm, machinery, and almost any other process. The Forney 309 is the first release after a sort of 're-launch' for the company which includes many upgrades such as a higher duty cycle, a quick disconnect, a longer gun, and so forth. Loyal Forney customers will be enamored with the convenience of the 309 and it's use on mild steel, stainless, aluminum and cast iron. For more heavy-duty job and industrial or commercial welding processes a larger 220V welder is recommended. These will usually cost a little more than the smaller units but will provide a faster, more powerful weld. The Eastwood 175 amp MIG welder is built for heavy-duty jobs running at a duty cycle of 30% at 135 amps. The machine is also very customizable with adjustable heat and wire speed settings to fine tune your welding styles. An internal fan also helps to regulate welds, directing air across heat sinks and cooling semiconductors. The product is covered by a 3-year warranty and is going to get the job done. Lotos is one of the most respected names in the welding industry and their MIG machines are consistently one of the top sellers. This welder provides some versatility in the form of welding steel or aluminum (spool gun included free). Steel capacities on the MIG 175 range from 18ga to 1/4” with aluminum reaching 1/8” or thicker. Usually 220V welders can be difficult for beginners to operate but the Lotos 175 has so many safety features included it is a good 'learning' welder. For example the machine is equipped with a temperature controller, an overload breaker, and two automatic circuits protecting the wire feeder which means the product can be run with sound peace of mind. Craftsman is one of the most trusted names in tools and their 20508 MIG/flux core welder continues that trend. This MIG welder is very hard to come by but if you can find one then you should buy it, it's hard to be beat. The 20508 is a very heavy unit at almost 200 pounds but the accompanied wheel kit makes portability a possibility. The 20508 can handle metal as thin as 18ga all the way up to 3/16” comfortably. Craftsman is also very safety-oriented with this welder as it contains automatic thermal overload protection as well as a Tweco type torch with on/off safety control. The model operates on any standard 220V and features a MIG gas regulator and electronic spot timer to help increase the quality of the welds. Welders with a multi-volt plug are all about versatility. Being able to switch back an forth between currents is great for portability and alternating between heavy-duty welds or ones that require more precision. The Hobart 500553 is about as versatile a machine as there is in the welding industry. For example not only can the model shift between 115V and 230V operation, it can fuse metals ranging from as thin as 24ga all the way up to 3/8” thick. The unit features 7 different voltage settings for maximum optimization and has a quick change drive roll system to minimize downtime. The duty cycle is 20% at 90 amps (115V) or 30% at 150 amps (230V). The 500553 automatically adjusts itself to the correct power to provide superior arc performance. With any MVP welder you can expect to pay a lot but for the 500553 isn't all that out of line, especially with the versatility, portability, and weld performance it provides. Miller is perhaps the most prestigious name of quality when it comes to the welding industry. The first thing that may strike out about their 211 MVP model is the price tag but understand this isn't a machine designed for tinkering. The 211 is an elite MIG welding machine that features an auto-set control to automatically update conditions for the material and speed of the weld. The infinite voltage control system helps fine tune these settings and the result is a crisp, clean, quality weld that is visually appealing and durable. The Millermatic 211 can fuse mild steel from 24ga to 3/8” or aluminum 18ga to 3/8”. The unit is portable and manageable to carry at just over 70 pounds. For advanced welders who don't want to deal with defects and misused settings or for beginners who want to learn on the best, it's hard to beat the Millermatic 211. The Forney 324 MVP is truly a multi-process portable welding station. Not only does the machine easily shift from 120V to 220V, the unit is set up for MIG, flux-core (gasless), Stick, and TIG welding as well. Instead of purchasing multiple welders for different needs the Forney 324 offers a convenient investment with ultimate flexibility. Steel up to 3/8” thick or more is well within the Forney 324 capabilities and a digital readout helps control the output current and arc voltage among other data. This 3 in 1 welder is put into use not only by automotive, industrial, and farming applications but the versatility makes it a go-to choice for artists as well. We will rank three different categories of MIG welders (110V, 220V, and Multi-Volt Plug). A powerful welding output is important even if you are mostly doing small welds, if anything to have the versatility to perform larger jobs. A quality MIG welder will stand up to the rigors of the job you're performing, no matter how heavy-duty they may be. Of course it's important to not overwork and burn out the welder but a cycle of 60-80% is feasible. Even if MIG is the main type of welding being done the technologies exist to permit wire feed flux for aluminum bonding and some types of stick welding. Along those same lines both gas and gasless MIG welding should be capable. The quality of weld is determined in equal parts by the skill of the welder and the capabilities of the machine. That being said a home user should not need a welding certificate to operate the MIG welder. Having the ability to weld at your home or in a shop is a great convenience but it doesn't reach the extents of parts that might need fused. A quality MIG welder should be portable to repair things out in the field, to loan as a favor, or to take somewhere to have repairs conveniently. There's a slippery slope when you want a high-performance MIG welder with tons of features but are surprised at the high asking price. 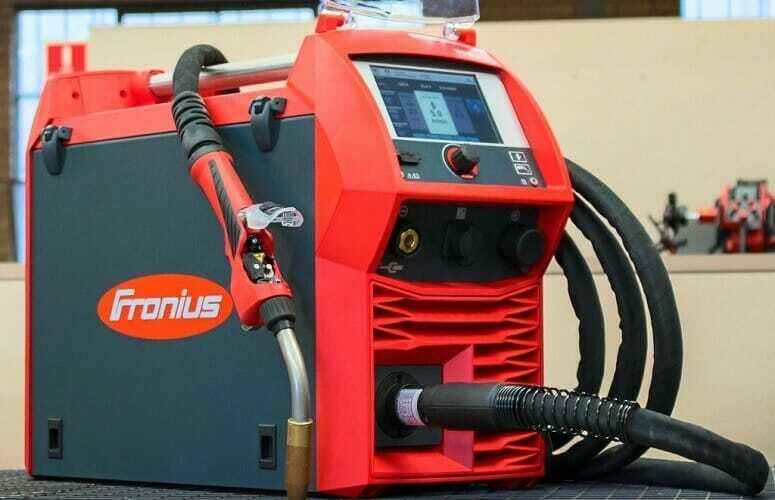 You should seek a machine that offers value for the types and frequency of welding that you'll be doing but also one that offers peace of mind with a 3-5+ year warranty. Which of the above factors that are most important to you depends on your individual uses and welding needs. Typically the MIG welders that make up the 'best of the best' will offer some combination of performance, convenience, price, etc. We've ranked the top 3 MIG welders in each power output to help sort out the pretenders and determine the contenders for placement in your shop. To find the perfect MIG welder you need to first evaluate your skills in fusing metal and then determine your frequency of use. For example a lower-end MIG welder ($200-$300) works great for perfecting your technique and doing small jobs around the house. Eventually when weld safety and appearance is important and when you start doing more repairs or builds that require the fusion of metal it can be time to upgrade. The more you learn about welding, the more features that will be unlocked within the individual welder machines.